Here’s an interesting art and comic project we came across at CTN Expo: Sillycan Vale, created by Lewei Wang. 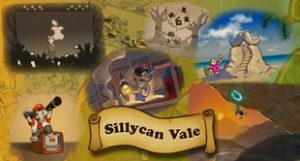 Current there’s a Kickstarter Campaign for the project, that explains it like this… “Sillycan Vale is a town where each animal villager is the personification of a tech company from the real world. The goal of this project is to develop the whole concept into a comic series. The characters & story-lines are inspired by what’s happening between the real tech communities especially in Silicon Valley, California.” Currently the plan is to release the comic in three separate volumes, introducing new characters and development art in each, and then release the actual complete comic in September of 2019. As of this writing they have already exceeded their initial funding goal, so go check them out and see what’s coming next.